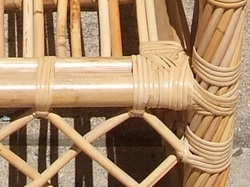 Unpeeled rattan lashed together with binder cane. Strong, durable and comfortable with cushions. 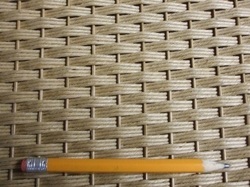 Reed wicker (from rattan) furniture uses many shapes; round, flat, oval. Woven into unlimited designs, then stained or painted, makes for endless looks. 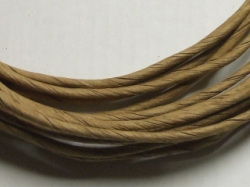 Fibre wicker (paper) uses fibre rush to weave with instead of rattan. The skeleton is fibre rush wrapped around a metal stake that gives rigidity and strength. It is stained, varnished or painted. 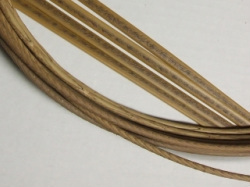 Round reed with flat reed wraps. 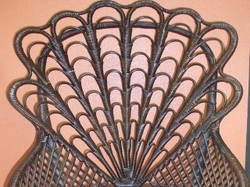 Virtually any design can be made from reed and was prolific from late 1800's- early 1900's. Still common today, but without the extravagent patterns of yester year. Lloyd Loom (invented 1917) is kraft paper twisted around a metal wire and paper threads which are placed on a loom, woven into a fabric and then stretched over a wood or metal frame. Considered an "all-weather" fabric. Painted in a variety of patterns & textures. Resin wicker uses a synthetic resin that is resistant to the elements. Commonly found on outdoor furniture, it is durable and easy to care for. 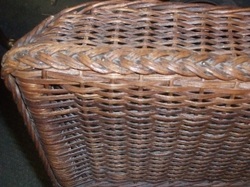 Wicker is a weaving process which uses many materials such as reed, paper, cord and resin. Because of this, the design, look, and feel of wicker furniture is endless. And with always changing finishes, is not going out of style. With so many possibilities, contact us so we may help you determine what you have. And if you want to repair it yourself, materials are available.